This set of videos in Kyoto should be the last from Japan as after this we headed for India! We were really excited about going to India as it would be a total flip from traveling in Japan. Not that Japan had been bad by any means, but the drastic cultural change in itself was exciting! Plus, we would get to eat cheap Indian food! We stumbled upon this temple while wandering around. We later found out it's one of the largest wooden structures in the world! It was HUGE! We found a shrine dedicated to hogs! So cute! There was a sudden downpour during our walk and, when the rain let up, we got this beautiful shot! Convenience store dinner! 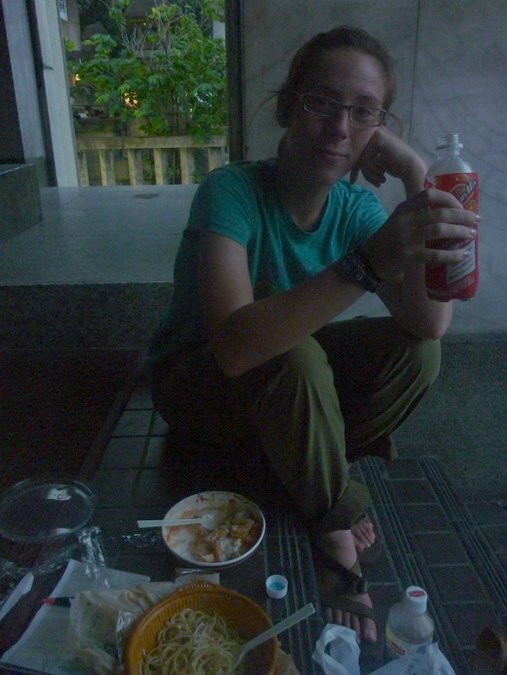 Note that sitting on the stairs of a building eating a meal looks really strange to Japanese people. We wandered into the Kiyomizudera Temple during the day and then returned at night to enjoy a parade which just happened to be going on! Seriously, this sign will kill you! Eric has reached gaming mecca! These discs were rather interesting. You paid 100 yen for 3 discs and the aim was to throw them off a cliff to rid yourself of bad luck! Kyde throws like a girl! Kyde - To be honest, a lot of temples and shrines just start to blur together after a while. Kinkaku-ji is not one of them. It sparkles and stands out amongst a plethora of others! Trust us. It needs to be said!